For the IAS aspirants, it is very important to know the trade balance of Indian economy. Through trade balance, a person can analyse the strength of an economy on a global platform. Here, we have put an analysis of India’s merchandise trade provided in the recent Economic Survey 2016-17, quite important for IAS Exam. 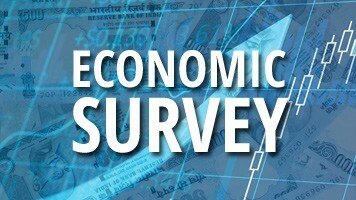 India is one of the fastest growing economies in the world. What makes it the fastest, an IAS aspirant must know the reasons behind such tremendous growth. Here, we have analysed India’s merchandise trade which registered motivating trends in the recent past few years. As per the Economic Survey 2016-17, India has sufficiently managed their trade deficit, which is quite important in terms of the preparation for IAS Exam. As compared to the global growth and trade, India's exports declined by 1.3 per cent and 15.5 per cent in 2014-15 and 2015-16 respectively. The trend of negative growth was reversed somewhat during 2016-17 (April-December), with exports registering a growth of 0.7 per cent to US$ 198.8 billion from US$ 197.3 billion in 2015-16 (April-December). During 2016-17 (April-December) Petroleum, oil and lubricants (POL) exports constituting 11.1 per cent of total exports declined by 9.8 per cent to US$ 22.0 billion over the corresponding previous period, while non-POL exports grew by 2.2 per cent to the US $ 176.8 billion. A large number of export sectors have moved to positive growth territory in April-November 2016-17 as compared to 2015-16. India’s exports to the regions like Europe, Africa, America, Asia and CIS and Baltics have declined in 2015-16. But the volume of India’s exports to Europe, America and Asia improved by 2.6 per cent, 2.4 per cent and 1.1 per cent respectively in 2016-17 (April-November), while exports to Africa declined by 13.5 per cent and the USA followed by UAE and Hong Kong were the top export destinations. The value of imports declined from US$ 448 billion in 2014-15 to US$ 381 billion in 2015-16, mainly due to the decline in crude oil prices resulting in lower levels of POL imports. The value of imports during 2016-17 (April-December) declined by 7.4 per cent to US$ 275.4 billion compared to the corresponding period of previous year. During the same period, POL imports declined by 10.8 per cent, Gold and silver imports by 35.9 per cent, non-POL and non-gold & by 2.0 per cent and the goods declined by 8.8 per cent. However, the positive growth was registered in pearls and semi-precious stones (19.0 per cent) and Food and allied products (1.3 per cent) while the imports of capital goods declined by 8.8 per cent. India’s imports from Europe, Africa, America, Asia and CIS & Baltics regions declined in 2015-16 while in 2016-17 (April-November), imports from CIS & Baltics region increased by 10.3 per cent but with other four regions witnessed a decline. The top three import destinations of India were China followed by UAE and USA in 2016-17 (April-November). During the financial year 2015-16, India’s trade deficit declined by 13.8 per cent (vis-à-vis 2014-15) to US$ 118.7 billion. Furthermore, the trade deficit is declined by 23.5 per cent to US$ 76.5 billion in 2016-17 (April-December) as compared to US$ 100.1 billion in the corresponding period of previous year. In accordance with the restoration exhibited by the exports in India in the last four months, during January, 2017 which continue to show a encouraging growth of 4.32 per cent in dollar terms (valued at US$ 22115.03 million) and 5.61 per cent in Rupee terms (valued at Rs. 150559.98 crore) as compared to US$ 21199.02 million (Rs. 142568.31 crore) during January, 2016. The cumulative worth of exports for the period April-January 2016-17 was US$ 220922.78 million (Rs. 1484473.55 crore) as against US$ 218532.64 million (Rs. 1420572.68 crore) registering a positive growth of 1.09 per cent in Dollar terms and positive growth of 4.50 per cent in Rupee terms over the same period last year. The exports of non-petroleum products in January 2017 were valued at US$ 19422.86 million against US$ 19111.38 million in January 2016, an increase of 1.6 % while the non-petroleum exports during April - January 2016-17 were valued at US$ 196254.10 million as compared to US$ 192071.50 million for the corresponding period in 2016, an increase of 2.2%. The augmentation in exports is positive for the countries like USA (2.63%), EU (5.47%) and Japan (13.43%) but the country like China has exhibited negative growth of (-1.51%) for November 2016 over the corresponding period of the previous year according to the statistics released by WTO. The total value of imports during January 2017 was registered as US$ 31955.94 million (Rs. 217557.32 crore) which was 10.70 per cent higher in Dollar terms and 12.07 per cent higher in Rupee terms over the corresponding level of imports valued at US$ 28866.53 million (Rs. 194134.02 crore) in January 2016. The cumulative value of imports for the period April-January 2016-17 was US$ 307311.86 million (Rs. 2065656.42 crore) as against US$ 326277.38 million (Rs. 2120158.57 crore) registering a negative growth of 5.81 per cent in Dollar terms and 2.57 per cent in Rupee terms over the same period of 2016.